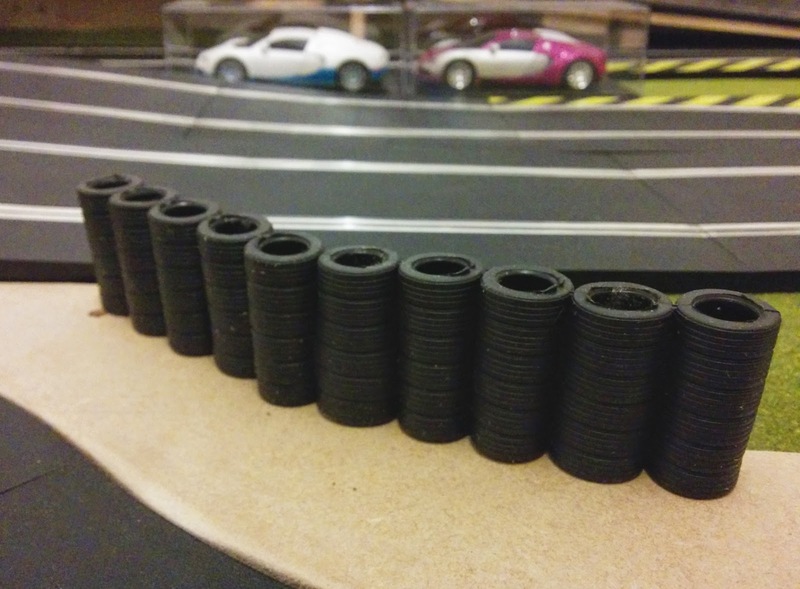 At several points round the semi permanent slot car track I have been putting together, there are custom made edges. These are to level the track with the curb so the car wheels do not fall off when drifting round corners. Made from 9mm MDF cut to fit the curve of the track with a chamfered edge to drop to the 8mm track height. 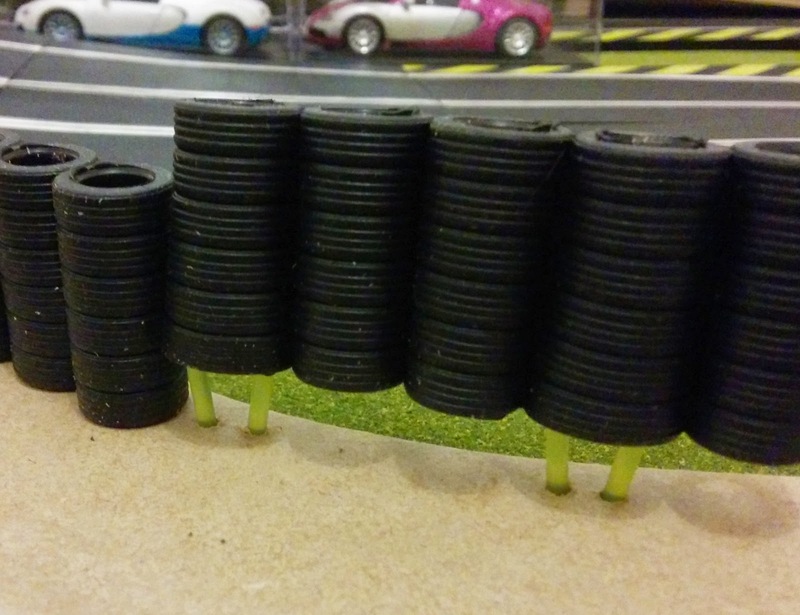 For those custom sections, rather than barriers to stop cars straying too far from the track I have fitted tyre walls. I think these add a bit of extra interest and break up the monotony of having all the same barriers. There are other scenery items from the same supplier but at the moment I am not after creating a full diorama, but just a nice to look at and practical to race on track. I have added a sheet of scenic grass matting under the entire track to break up the expanse of MDF. This is Woodland Scenics Ready Grass matt. I selected the Spring Grass 50"x100" roll. That was big enough to cover my 2.4m x 1.2m board in a single piece. The track and borders sit on top of the grass matt. Perhaps in a bit of extreme safety consciousness, instead of fitting the tyre walls to the borders using a simple screw sticking up out of the MDF, I have used a loop of plastic. My thinking is that if I lean across the track to recover a car I am less likely to accidentally put my hand down on something painful. I hunted the shed for suitable plastic and 3mm diameter strimmer cord fitted the bill perfectly. Cut to length, bent over and pushed in to two 3.2mm holes drilled close together, about the width of the inside diameter of one of the tyres in the tyre wall. Two loops per tyre wall. 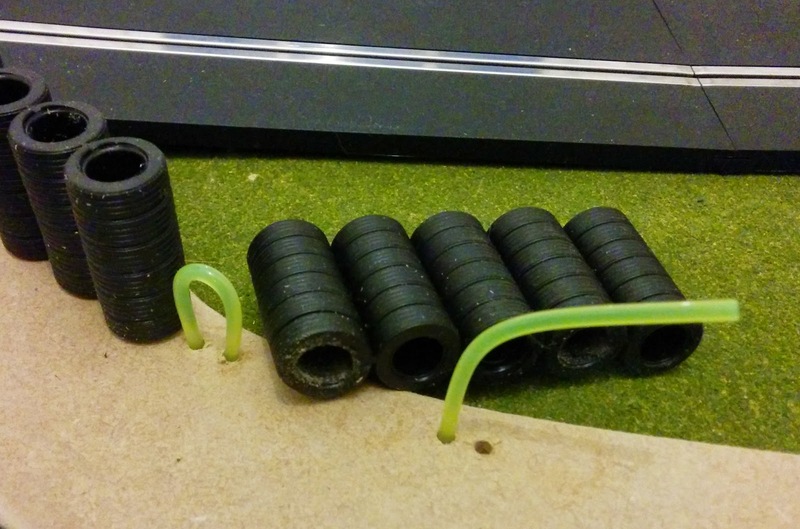 The result holds the tyres perfectly and is very easy and quick to fit.